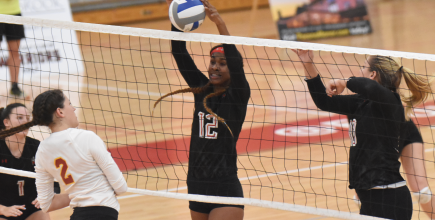 ESU Volleyball notched a pair of impressive wins over its PSAC West rivals last weekend. The Warriors handed nationally-ranked Gannon University its first loss last Friday night and followed that win by beating Mercyhurst University last Saturday to post an impressive 11-2 record on the season. Freshman middle blocker Kailyn Pyle had two monster games. Pile recorded 12 kills against Gannon and 9 kills against Mercyhurst. The PSAC recognized Pile’s outstanding performances by naming her the PSAC Women’s Volleyball Athlete of the Week last Monday. Gannon’s Golden Knights came into Koehler Fieldhouse ranked No. 14 in the country with a perfect 11-0 record on the season. Gannon is a volleyball powerhouse. The Golden Knights made it to the PSAC Championship Game and the Final Four of the national tournament last season. But one of ESU’s biggest wins from last year was beating Gannon. So the visiting Golden Knights came into Koehler Fiedlhouse looking to avenge their loss from last season. The Warriors had other ideas and seized control of the match early. After dropping the first point, the Warriors rode senior setter Tina Predojevic’s serve to open up a commanding 7-1 lead over Gannon. But despite ESU’s fast start, the Golden Knights rallied to tie the game at 18. Then the Warriors went on a 7-4 run to close out the first set 25-22. The second set was also extremely competitive. Gannon held two match points at 24-23 and 27-26. But facing match point at 26-27, the Warriors won three straight points to take the second set 29-27. Then ESU won the third set 25-21 to give Gannon its first loss of the season. Rodgers and the team were ecstatic after the game. “It’s one of the biggest wins. They are the fourteenth-ranked team in the country right now. I don’t know if ESU has ever beaten a nationally-ranked team that high,” Rodgers said. “They are a phenomenal team, and for us to go up against them and to beat them pretty convincingly–that just shows a lot of character for our team,” Rodgers stated. “I think we just took them really seriously, and we just really wanted the ‘W’ in front of everybody,” Dunphy stated. In the next game, the Warriors beat Mercyhurst in four sets. Set scores were 27-25, 25-23, 18-25 and 25-15. “In the last two years, we went five sets with Mercyhurst. So this is good,” Rodgers stated. “We didn’t play that clean in the third set, but we played much cleaner in that last set,” said Rodgers. “Just played our game. Got some solid blocks. Had our best hitting percentage of the match in that last set, so that showed how badly we wanted to win,” Rodgers stated. Redshirt junior outside hitter Sarah Smith finished with 16 kills and three blocks against Mercyhurst. “Sarah Smith had five kills for us in the last set,” Rodgers stated. “She has always been consistent for us. Sarah Smith is always up there,” said Rodgers. The Warriors (12-2, 2-0) will play a pair of road games against Edinboro tomorrow night and Slippery Rock on Saturday afternoon.